The March of Dimes works to improve the health of babies by preventing birth defects, premature birth and infant mortality. � Search the March of Dimes website and learn all about prematurity, birth defects and healthy pregnancies. � Watch and share the March of Dimes Teen 2 Teen healthy lifestyle videos: http://marchofdimesyouth.com/videos. � Go to the Facebook group and fan page "March of Dimes Chicago Division" and Twitter account @marchofdimeschi and encourage your friends to do the same to spread the word about premature birth and how we can give every baby a healthy start! � Check out the Fight For Preemies. November is Prematurity Awareness Month and there are lots of activities in which you can participate during this month. � And most of all... Participate in March for Babies! Our biggest fundraiser and event of the year! 1. 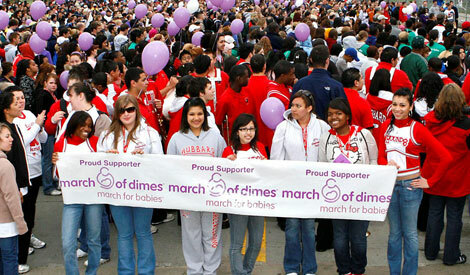 WALK: Youth volunteers for the March of Dimes are an integral part of our fundraising efforts. While fundraisers to benefit the March of Dimes are encouraged year round, the most successful way to help is to start a March for Babies walk team for the walk in April and conduct fundraising efforts to raise money for your team. Student teams have a history of being a great team building experience for the students while greatly benefiting the March of Dimes fundraising goals. To walk in March for Babies, visit www.marchforbabies.org and create your team! Team registration begins on December 1 for the April 17 walk day. Team fundraising efforts are a year-round activity! 2. VOLUNTEER ON WALK DAY: If our youth volunteers elect to not start a walk team, but still want to help the March of Dimes, they are encouraged to volunteer to help out on Walk Day (April 17). Volunteer responsibilities range from registration, to handing out water a check points, to post walk clean-up. These responsibilities will be determined by each walk-site coordinator and assigned to each volunteer. There are countless ways to raise money for your March for Babies team, or for a general donation to the March of Dimes. Here is a list of some of the ways our young teams have raised money in the past! 1) A Blue Jeans for Babies or a Pajamas for Babies day - With the permission of your school's principal or superintendent, host a day where any student who donates a determined amount (usually $5) to your walk team or to the March of Dimes Chicago Division is allowed to wear blue jeans or pajamas to school! 2) Asking local parents and businesses to be walk day sponsors for you or your team. 3) Get creative! Come up with your own ideas to raise money in your schools. Past success has been seen with things like Penny Wars, bake sales, or fundraising dances. As long as your school approves, March of Dimes encourages your efforts! If you choose to participate in March for Babies, teams often create T-shirts or other team paraphernalia to wear on walk day. While this is not required, it is a great way to raise team morale and generate excitement for your team and for your school! Volunteers will be debriefed before the walk by their walk-site coordinator, but are encouraged to dress appropriately for whatever the weather may be that day. There are six Chicagoland area walk sites, including the largest at the Chicago Lakefront. Your team can walk at the site closest to your school! These sites can be found (after December 1) when creating your team at www.marchforbabies.org.